It’s London Fashion Week, and if you don’t have front row seats, don’t worry. 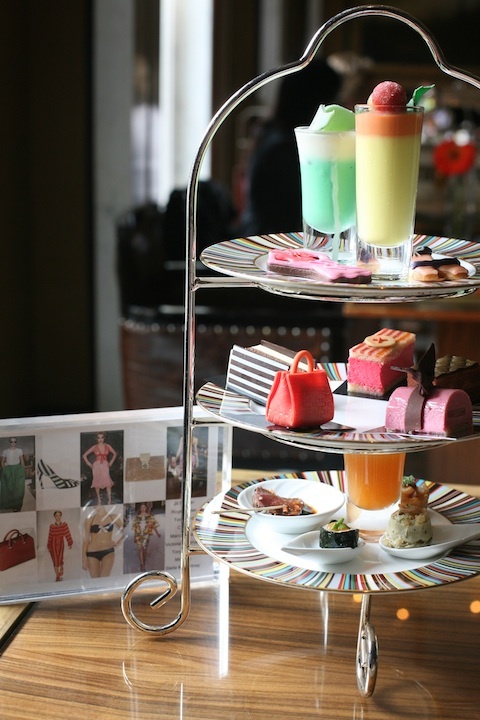 The Berkeley Hotel’s Pret-a-Portea – a fashionista’s afternoon tea – is the perfect way to find out the hottest looks for this season. 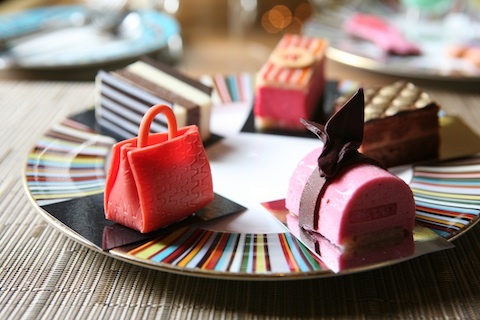 Each season the chefs recreate signature bags, clothes, shoes and even sunglasses in cookie, cake and chocolate form. Fashion and food. Who would have thought? This is definitely not a traditional afternoon tea – forget scones and cream – but there’s still crustless cucumber sandwiches. The real show stoppers are the desserts. Paraded on three tiers of Paul Smith’s psychedelic Thomas Goode crockery, the sweets are almost too cute to eat. The 2011 Spring/Summer collection starts the adorable Miu Miu vanilla bikini biscuit – a buttery take on sailor chic swimwear. Tom Ford’s light pink chiffon summer dress even comes with sparkly silver cuffs – entirely edible of course. The Stella McCartney citrus print dress is given new life as a zesty mousse but you can’t go past Jil Sander sunglasses and crème de menthe. As usual Marc Jacobs is bold and beautiful – an intense raspberry and lychee cream ‘jumpsuit’ is wrapped up in a dark chocolate flower belt. Shoe lovers will shovel down the Roger Vivier black and white layer cake but the “it” bag is a gold chocolate Chloe clutch with crunchy praline. This season’s hottest look has to be Victoria Beckham’s tote – the tiny, peach-flavoured bag is perfect right down to the crocodile print. And who could forget Tony Burch’s strawberry and rhubarb bavarois dress with its big, gold button. When the tea stand is put down on the table, there’s only one of each item. Like a Prada sample sale, you’re readying your forks to fight it out over the best bites. Luckily, there’s more in stock and the friendly staff will keep replenishing your plates until you call it a day. Like any designer goods, there is a price tag. 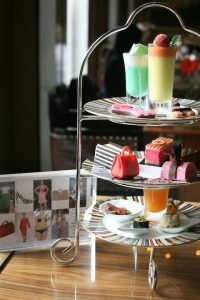 Pret-a-Portea starts at 36.50 pounds, add a glass of Laurent Perrier Champagne and it’s 46.50 pounds or really indulge with Couture Champagne for 53 pounds. The Berkeley Pret-a-Portea is served daily between 1 – 5.30pm at The Berkeley Hotel, Wilton Place, Knightsbridge.